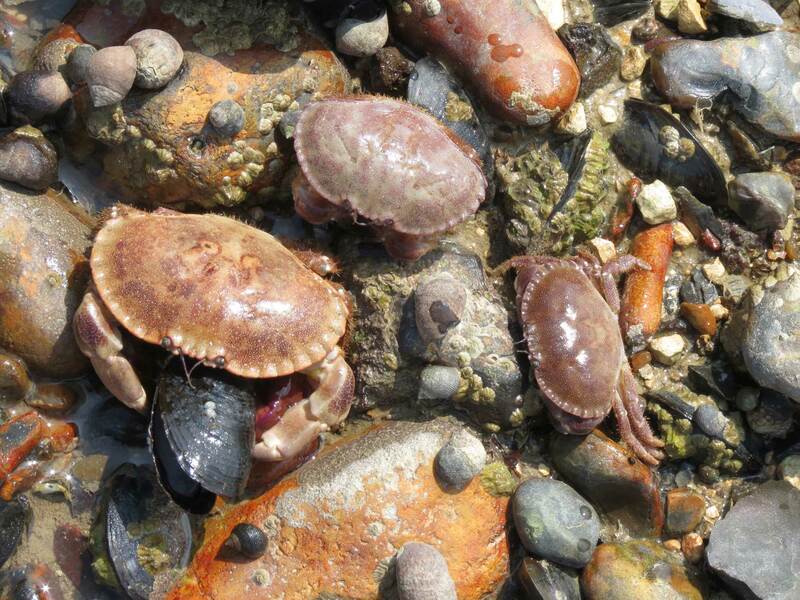 Six large Edible Crabs, Cancer pagurus, were landed at Littlehampton, Sussex, from 25 milles offshore in the English Channel. The largest one weighed 4.4 kg (9 lb 4 oz) with a carapace width estimated at about a foot (300 cm). 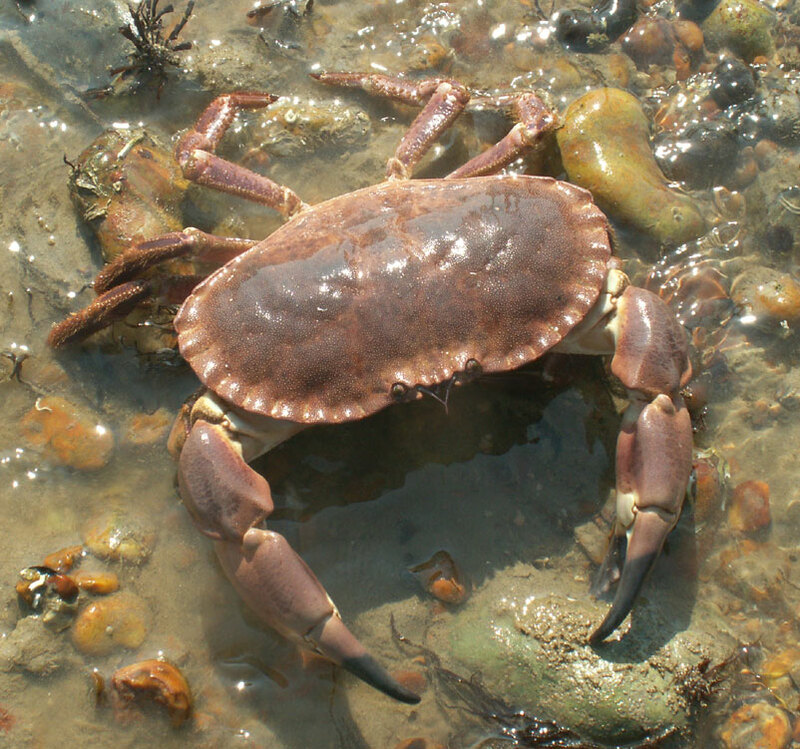 Another huge Edible Crab, Cancer pagurus, was discovered and brought ashore by Paul Worsley diving in Lyme Bay, Dorset. It was estimated to be 300 mm wide across the carapace and a crab of this size would be the largest on record. (The largest recorded specimen known was 285 mm wide.) Its huge size can be verified by the photograph in the Western Morning News but unfortunately the crab was eaten before a tape measure could put on the shell and photographed to verify the crab as the largest on record. 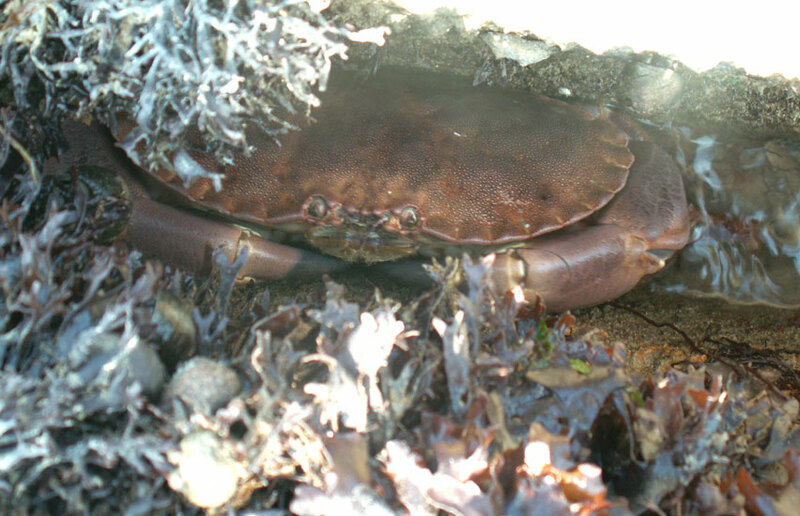 A huge Edible Crab, Cancer pagurus, was captured and brought to the surface from a plastic barrel on the seafloor at Balaclava Bay off Portland, Dorset. The male crab was not measured but estimated to be about 30 cm wide across the carapace. It was found a home in Weymouth Sea Life Centre. Both its massive claws were intact and bigger than my hands. 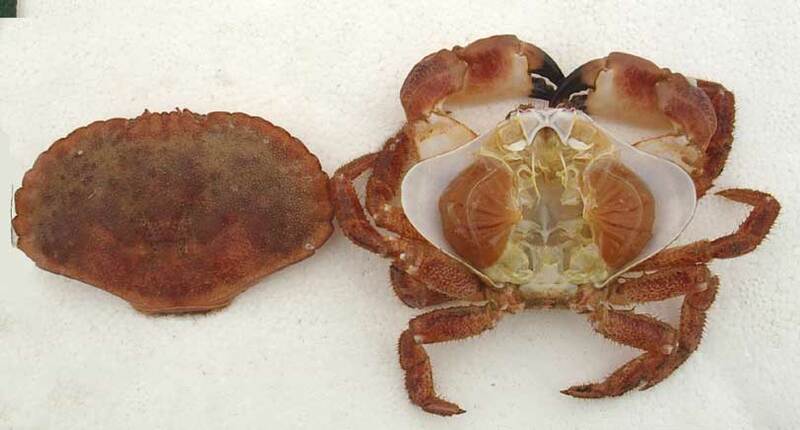 In response to your message on the large brown crab, a colleague here at Cefas has measured a crab with a carapace width of 292mm, and a weight of 14 lb, at a processors in Selsey back in 2003. Unfortunately, as always seems to be the case, no picture was taken of this to provide proof of size and thereby become a new official record. Though it does show that the current 'recorded' size record for this species (of 285mm in the Museum National d'Histoire Naturelle, Paris) most certainly could of been broken several times by now. I am currently involved in an extensive brown crab tagging program in the English Channel and have so far tagged and released over 7000 crabs from onboard commercial vessels. To date our largest recorded specimen that we have tagged is only 246 mm (Male). Unfortunately as the large males command the highest prices at the processors fishermen would probably hold back any really large males from us (as we only pay £1 for every commercial sized crab we tagged and released back over the side). However I am constantly on the look out for exceptionally large specimens and keep my camera and calipers close at hand at all times. We are currently aiming to tag a further 7000-8000 crabs so still may come across a large specimen which I can guarantee will be properly documented and preserved! Incidentally I am sure there will be crab processors around the coast who would not be surprised to hear of crabs of up to 30 cm in width but again no doubt they will have no records of the largest specimens that they have ever processed. 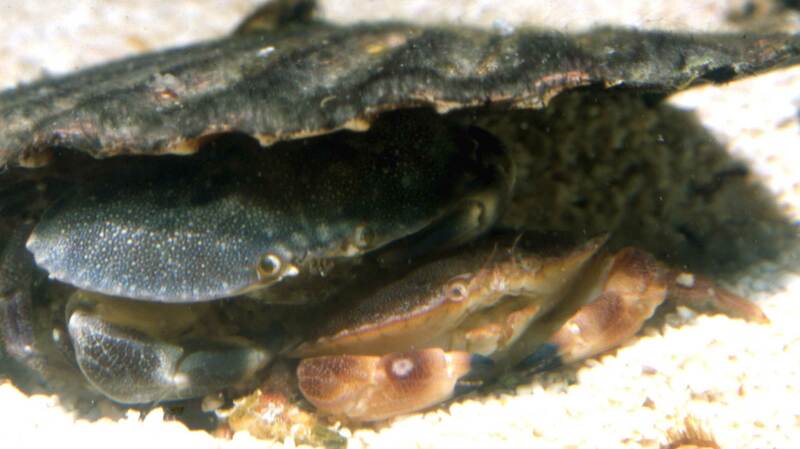 It is often claimed that 300 mm is the maximum carapace width in the European Edible Crab Cancer pagurus. However it is clear that most books copy each others, without giving original information. The biggest Cancer pagurus that I was able to measure is a male from the collection of the Museum National d'Histoire Naturelle, Paris. This specimen which was probably collected over 150 years ago had a carapace length of 165 mm and a carapace width of 285 mm. Is anybody aware of records of bigger specimens?